If you like bananas, then you’ll love this recipe that’s just a slight variation from the traditional French Toast, as it contains bananas and cream in the batter. Put eggs, 1/2 banana, cream and a dash of cinnamon in a mixing bowl. Mix using hand mixer (or blender) until smooth. Heat large skillet over medium-low with cooking spray. Soak each piece of bread in egg mixture just long enough to make sure it’s saturated. Transfer to skillet and cook until lightly browned on each side. Remove from heat and serve with other 1/2 banana, cut into slices, a sprinkle of powdered sugar and syrup. 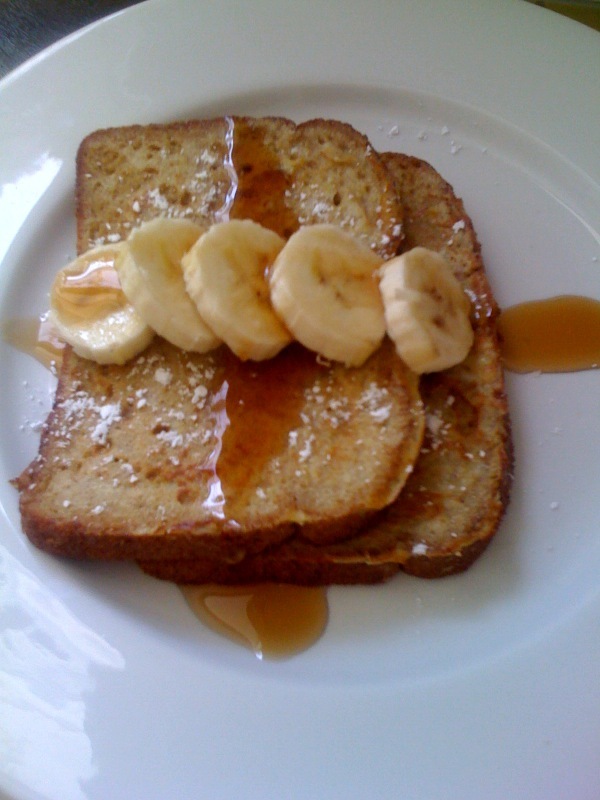 This entry was posted in Bread, Muffins, etc., Breakfast, Fruit, Recipes, Vegetarian and tagged bananas, bread, breakfast, french toast, recipes. Bookmark the permalink.